You are here: Home / why travel / The Thoughtful Travel Podcast: Episode 15 – Travel Builds Confidence, So Do It! 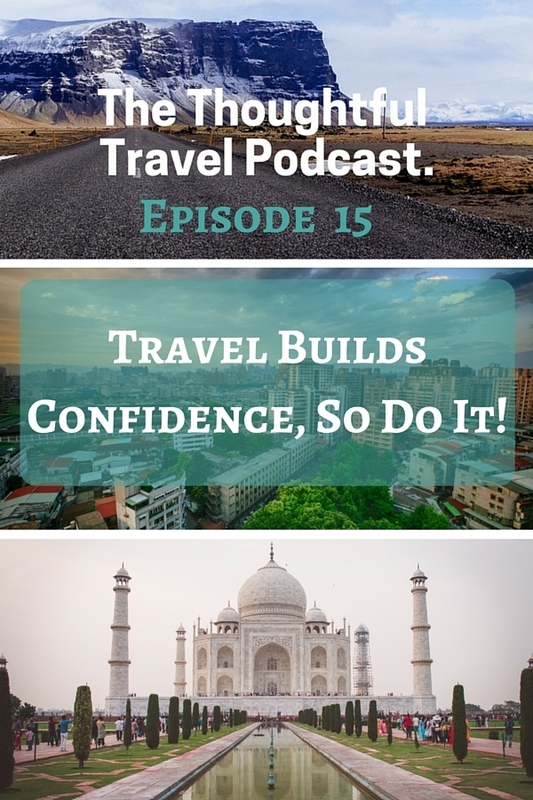 The Thoughtful Travel Podcast: Episode 15 – Travel Builds Confidence, So Do It! The very first story I ever told on The Thoughtful Travel Podcast (way back in Episode 0) was a tale of a very important (yet seemingly random) moment in my travelling life when I realised that travelling had given me a massive confidence boost. This confidence is something that infiltrates into all aspects of my life, whether I’m at home or elsewhere, and it has definitely been life-changing. What has made me even happier is to hear that many of my fellow travellers feel the same. Chatting with this episode’s three guests and hearing about how travel has made a big difference to their self-confidence too really made my heart sing. Show notes for Episode 15 – Travel Builds Confidence, So Do It! Gaining confidence from your travels is just one more great reason to get out there and travel often. In Episode 15 of The Thoughtful Travel Podcast I talk to three guests who all agree that travelling has increased their confidence substantially and helped them out in all kinds of ways, including life beyond travel. First up, I speak with Jeff Sandquist of Intentionally Wandering, who only started travelling relatively recently and learnt so much from it – travelling gave him a brand new kind of confidence. After that I speak with Annalicia Lynn who spent a year living and working in Taiwan and was particularly able to notice how much her confidence had grown when her family came to visit. My final guest is Candace Rardon, and when I spoke to her she was spending a couple of months in Norway writing a book about a trip she took to India, which was the kind of trip which pushed her far outside her comfort zone and therefore boosted her confidence significantly. You’re so welcome Ava – it was a very interesting one!